Chapter III of Book I of Calvin's Institutes: "The Knowledge of God Has Been Naturally Implanted in the Minds of Men." Calvin's point in this short chapter is that humans are naturally religious. He says that a certain type of divine knowledge has been "inscribed" or "implanted" in our hearts, so much so that no matter how primitive a people group you could locate, they would have some knowledge of the divine in their hearts. Calvin says that even man's constant idolatry is proof of this--why else would haughty man be so eager to continuously set up something higher than himself to worship? 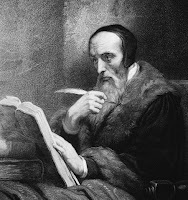 Calvin acknowledges that religion has from time to time been imposed upon people to gain an advantage over them, but says that this would never have been successful were it not for the natural tendency and innate need to worship. So strong is this need for worship, so real the knowledge of a transcendent God, that even those who ardently deny God's existence express great fear and dread of suffering his wrath. Calvin finishes by saying that this innate knowledge of the divine and the need to worship, implanted in us, is what sets us above the beasts. I'm not sure what to make of this chapter of The Institutes. As was mentioned with the last chapter, we need to be sure to read this one in the context of what is coming after, specifically as Calvin moves from describing man in his primitive (pre-fall) state and into describing man's relationship to God now, after sin and chaos have entered the scene. With that said, Calvin isn't merely trying to describe man in his purity here, as evidenced by his references to the pagans who have knowledge of God as part of their nature. As it relates to this discussion, I can't help but wonder whether or not it is proper for us to describe man's lack and corruption as an innate "knowledge of God." That is, I'm not sure that the answer is implied in the questions man asks about the world, life, and existence. It seems that Calvin assumes, however, that this is the case. I also think it is questionable to refer to man's religious nature as evidence that all people have innate knowledge of God. Do we see someone worshiping an idol and claim that this person has knowledge of God? Is it right to call this idol "God," if we mean to refer to the one true God revealed in Jesus Christ? Of course, there is a way to save Calvin from this condemnation. We can understand him as a Christian theologian with a theological starting point, explaining man's religiosity and idolatry in light of the revelation of God and man effected in Jesus Christ. If this is the case, although Calvin appears to be starting from the bottom up and moving from man to God in this chapter, it would probably be better to see him as assuming the biblical witness and explaining the phenomena of man's existence with a theological or Christological starting point. From what we know of Calvin, I'm quite certain at this point that this is how we should interpret him. It's been interesting to see this idea taken up in philosophy of religion circles, a la Reformed epistemology and Plantinga. I'm not sure the notion of a sensus divinitatis is defensible on any empirical grounds, and if it was, I'm not sure it would even matter. However it does seem to do some theological work for us in accounting for human nature. So you question this idea on grounds that it does not seem a valid induction from basic human experience. That may be true prior to accepting revelation, but what about after? Is there any validity to the induction, which seems to me to be grounded in Calvin's prior assumption of the biblical witness? Then again, from what you've quoted from the Institutes, it sounds like Calvin wants to make this a sort of a priori fact of nature, sort of like the classical and patristic philosophers who said that all men everywhere desire happiness. I wonder if it is more theologically informed than that. The innate knowledge of God, or 'sense of divinity' may very well depend upon revelation for its legitimacy. It may depend, in fact, on a scriptural understanding of what it means to be creatures created for God and accountable to Him. That may mean Calvin is less concerned with establishing a universal a priori fact than developing a comprehensive Christian horizon of understanding - to avoid the lame word 'worldview' in saying that!